Bread. Cheese. Wine. Beer. Coffee. Chocolate. Most people consume fermented foods and drinks every day. For thousands of years, humans have enjoyed the distinctive flavours and nutrition resulting from the transformative power of microscopic bacteria and fungi. 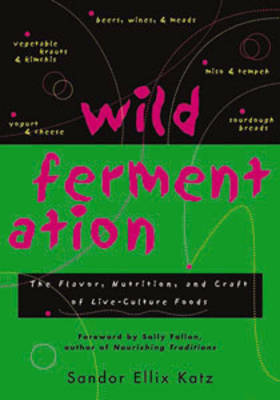 Wild Fermentation: The Flavor, Nutrition, and Craft of Live-Culture Foods is the first cookbook to widely explore the culinary magic of fermentation. "Fermentation has been an important journey of discovery for me," writes author Sandor Ellix Katz. "I invite you to join me along this effervescent path, well trodden for thousands of years yet largely forgotten in our time and place, bypassed by the superhighway of industrial food production." The flavours of fermentation are compelling and complex, quite literally alive. This book takes readers on a whirlwind trip through the wide world of fermentation, providing readers with basic and delicious recipes - some familiar, others exotic - that are easy to make at home. The book covers vegetable ferments such as sauerkraut, kimchi and sour pickles; bean ferments including miso, tempeh, dosas, and idli; dairy ferments including yogurt, kefir and basic cheesemaking (as well as vegan alternatives); sourdough bread-making; other grain fermentations from Cherokee, African, Japanese and Russian traditions; extremely simple wine- and beer-making (as well as cider-, mead-, and champagne-making) techniques; and vinegar-making. With nearly 100 recipes, this is a comprehensive and extremely wide-ranging fermentation cookbook.